So much food, so much booze. I am stuffed! Ah but it’s just so fun while it lasts (and the fun is not quite over yet). 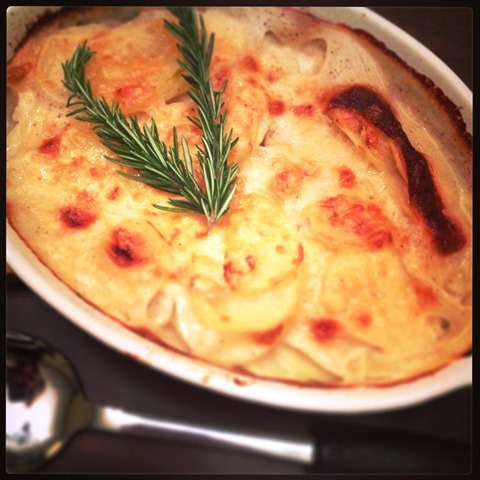 Above and below, a delicious little weeknight dinner that only comes together due to random December days off work. 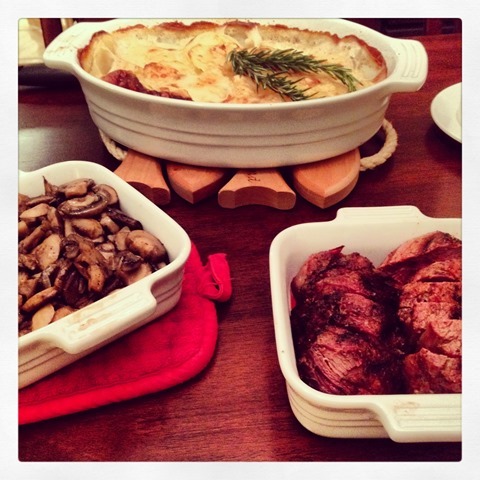 Fillet minion, scalloped potato gratin, mushrooms in sherry sauce. And a sip of Cleveland Whiskey’s Christmas Bourbon, all spicy and warm. Weeknight dinner perfection. Last weekend was particularly fun as my brother came in from Chicago, my sister in from DC, and I already live here :). It was a blast. 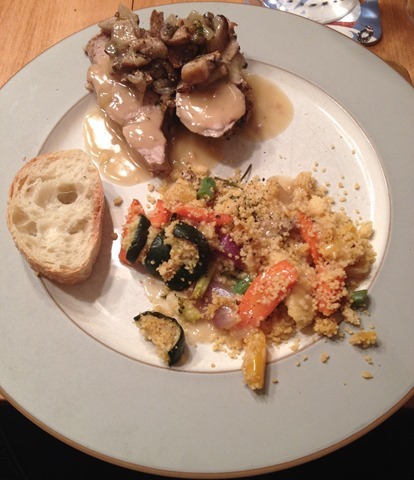 Friday dinner was enjoyed at home, mushroom-stuffed pork tenderloin, vegetable cous cous and crusty French bread. Lots of board games, lots of cheese and wine, lots of fun ensued. Saturday my family went out shopping at the Westside Market and to the Rock Hall, while I stayed behind trying to recover from the cough that never ends. Luckily I was well enough to attend my high school friends’ annual Christmas party and a family dinner at our favorite spot, Spice, in the evening :). Shared bites of Polenta Chickpea Fries, Flatbread, Mushroom Beignets and Ohio Cheeses, followed by OXTAIL BUTTERNUT GNOCCHI – squash, greens, ricotta & pan reduction. Like soft, tasty pillows of heaven. On Sunday, my siblings and I ventured downtown for a family photo shoot, a surprise Christmas gift to our parents. Despite the rain it was a warm day, perfect for frolicking all over downtown Cleveland and snapping lots of photographs together. Followed by a traditional English Sunday Lunch – roast beef, Yorkshire puddings, roast potatoes and veggies. And then a cheese board….a whole lot of Wii games…and then some homemade sausage rolls and local ice cream. Hello delicious food coma. And we haven’t even talked Christmas yet! More on that feast next time we meet. Someone get me to the gym. The food (and booze!) has been never-ending – omg! Happy Christmas, Beth!